"Poussin's much-admired work, then in the Barberini collection, is usually cited as having greatly influenced Banks's composition, but Gavin Hamilton's Andromache Mourning the Death of Hector (1761, now lost), exhibited at the Society of Artists [London] in 1762 and engraved by Domenico Cunego in 1764, is perhaps a more important source. Hamilton's innovative painting, itself influenced by Poussin, established the compositional complements for the deathbed scene, a popular theme in late eighteenth-century art. 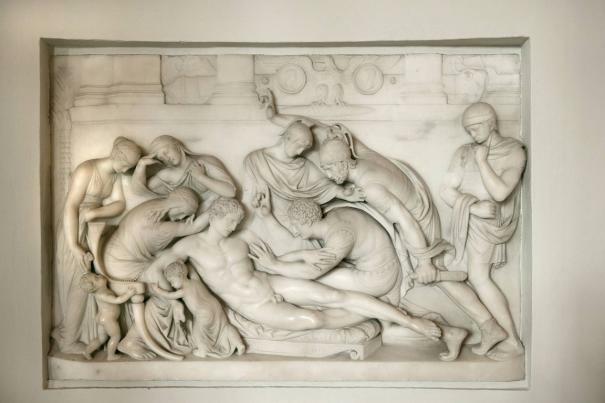 Banks's relief, which reverses Hamilton's design, repeats its frieze-like arrangement of the figures and strong horizontal accent. The seated figure of Agrippina echoes Hamilton's grieving Hecuba, while the wide curve made by the two generals bending towards the fallen hero repeats the rhythm of Andromache's body as she embraces Hector. The solder at the far right, whose pose is common to that of the mourning figures on antique reliefs, finds its counterpart in the figure of Helen at the far left in Hamilton's composition." Nancy L. Pressley, The Fuseli Circle in Rome. Early Romantic Art of the 1770s (New Haven: Yale Center for British Art, 1979), 49.